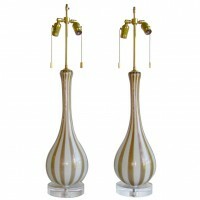 Pair of Italian “circus tent” pattern art glass lamps by Barbini. Aventurine stripes alternate with white stripes overlaid with subtle gold inclusions. Rewired with custom acrylic bases, and new unfinished brass on/off double clusters.